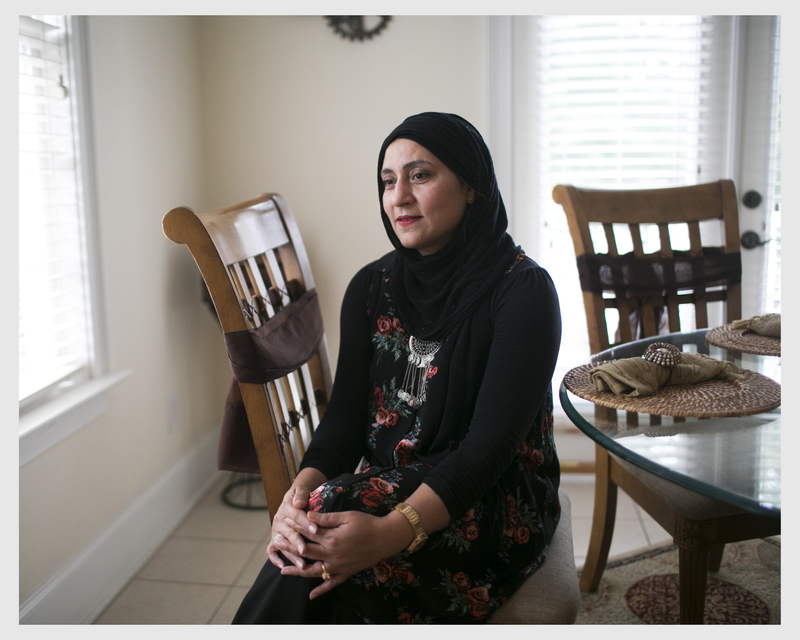 Ruby Abid in her home in Mount Pleasant, South Carolina. But midday on Fridays, Abid takes a pause from work for Jummah, the Friday prayer services at the Central Mosque of Charleston, a former church on a corner lot in a working-class neighborhood. A police patrol is stationed in the parking lot during worship. The mosque’s former president, Shahid Husain, said it was just one of several houses of worship in Charleston that have been targets of threats or attacks, including the mass killing of nine people by a white supremacist at Emanuel AME church last year. During prayers, men sit in the main room where the imam leads prayer, while women are on the other side of a partition through which they can see and hear, with a separate entrance. Abid, a naturalized U.S. citizen who moved here from Pakistan two decades ago, is one of the hundreds of thousands of Muslim American voters who will get to have their say in an election in which one of the two main candidates has openly proposed banning Muslims and immigrants from nations “compromised by terrorism.” According to data from the Public Religion Research Institute, there are only a handful of swing states that have more than 1 percent Muslim population. The Pew Research Center has estimated there were about 3.3 million Muslims in the United States in 2015, or about 1 percent of the population.1 By 2050, according to Pew, the Muslim share of the population should more than double, surpassing the number of Jewish Americans (who are estimated to decline to 1.4 percent from 1.8 percent now) and double the number of Hindus. The Council on American-Islamic Relations, using a private voter database from the company Aristotle, found that 824,000 registered voters in the U.S. matched a list of 43,538 traditionally Muslim names. That figure is roughly half of 1 percent of U.S. registered voters. According to CAIR’s research, that means more than 300,000 Muslim-American voters may have registered since the 2012 election, which the group said may be the result of political attacks on Muslims. The subject often comes up during Friday prayers at the Charleston mosque. A Monmouth University poll taken last month found that 17 percent of registered voters support banning all Muslims from entering the country, while 74 percent oppose the idea. (Support for the idea has fallen significantly since Trump first proposed it, and Trump himself has modified his plan.) In 2015, hate crimes against Muslims were at their highest level since the period just after 9/11. As a result, according to one poll taken in January of 2016, Muslim support for Clinton is higher than among any other religious group measured. The poll, taken by the Institute for Social Policy and Understanding, a research group focusing on American Muslims, showed that 40 percent of Muslims supported Clinton, compared to 30 percent of Jews and 13 percent of Catholics and Protestants. Only 4 percent of Muslims said they supported Trump. (The poll included other primary candidates besides Clinton and Trump.) 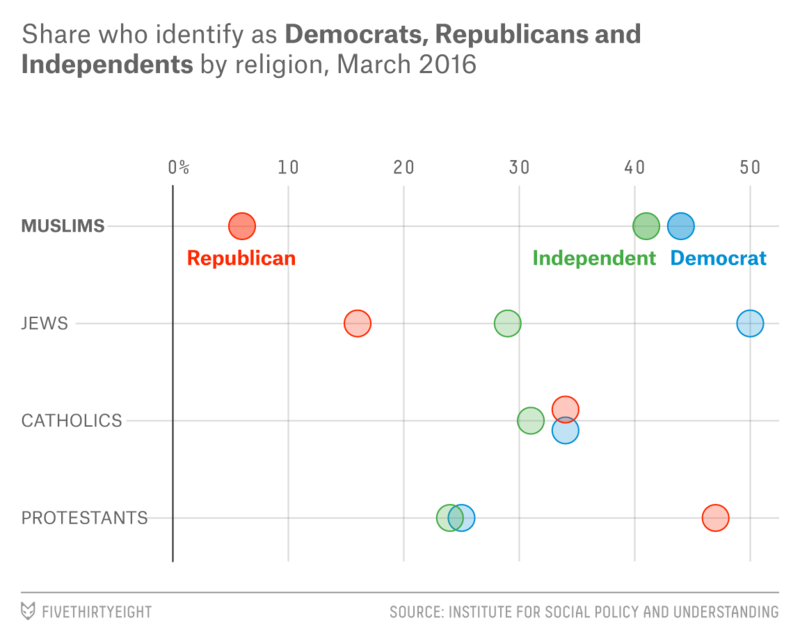 The organization also measured party affiliation by religious groups, and found Muslim Americans had by far the largest ratio of Democrats to Republicans. Some at the mosque mourned the tense relationship between the U.S. and parts of the Islamic world. Ismat Ullah Nawabi moved to the U.S. from Afghanistan in 1965, first to the New York/New Jersey region and later to Charleston to be near his grown children. He recalled that during his early years in Afghanistan, people there loved Americans. The group’s research indicates a weakness in Clinton support among Muslim-American millennials, similar to that among blacks and Hispanics in the same age group. Ruby Abid at home, and at the Central Mosque of Charleston. The Census Bureau does not keep data on religious groups. The private poll was conducted with a mix of robo-calls, live calls and emails sent to self-identified Muslims in Michigan, Pennsylvania, Virginia and Florida, using information from purchased voter databases.